This tool queries http://itunes.apple.com/linkmaker/, retrieves all available results and outputs a csv file, as well as a gexf file containing the relations between items in the itunes stores and their categories . The iTunes store scraper intends to make available to the digital methods researcher the data associated to items in the iTunes store. Per country and media type, e.g. music or e-books, the researcher can enter a key word as one would do in iTunes, Apple’s native interface for the iTunes store, and the scraper will retrieve all items on offer. With the use of the open source network visualization software Gephi, the .gexf file can be used to detect clusters of densely populated as well as related categories. More (technical) info about the fields returned can be found on http://www.apple.com/itunes/affiliates/resources/documentation/itunes-store-web-service-search-api.html. Figures 1 and 2 provide two examples of the .gexf output for the query [aging]. 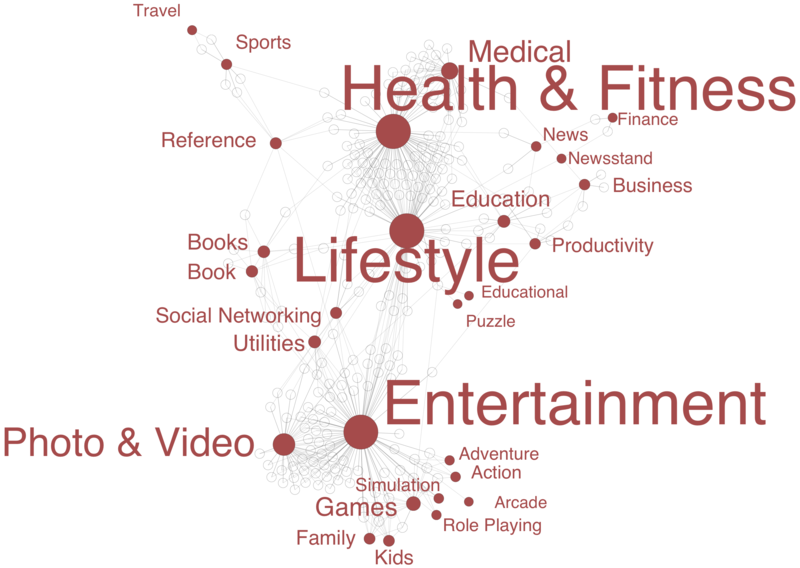 In both figures the red nodes represent categories and the white nodes represent the individual items. If an item belongs to a particular category, a link is drawn. The node size is proportional to the amount of links a node is connected to (degree). For the sake of legibility, only the labels of the categories are shown. Figure 1 shows the classification mapping of applications for the query [aging]. As can be seen, applications can belong to up to three categories and are mostly about Health & Fitness and Lifestyle. The third cluster is related to Entertainment as well as Photo & Video. Counter-intuitive at first, these apps allow the user to age head shot pictures, e.g. by making someone look bold. Fig. 1. Classifications mapping of the query [aging] for ios applications available in the US iTunes store. Figure 2 depicts the classification mapping of podcasts for the query [aging]. In the iTunes store podcasts mostly belong to only one category. 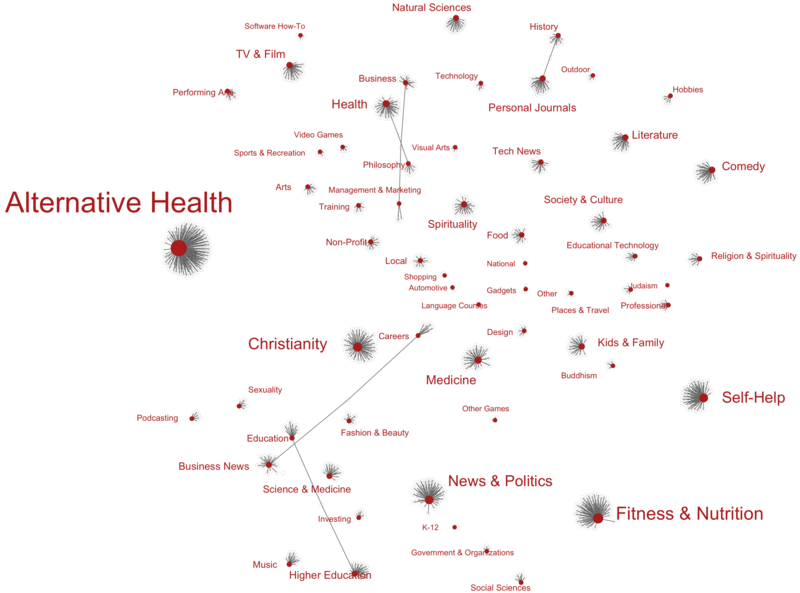 As such, the visualization can be read like a tag cloud. It is interesting to see that a different type of offering leads to a different description of ageing. Wile there is still a lot of focus on health it also becomes apparent that e.g. Christian podcasts often address the issue. Fig. 2. Classification mapping of the query [aging] for podcasts available in the US iTunes store.